In light of controversy over the matter, the professor was suspended by university officials and placed under review. Some Wheaton students protested her suspension, calling for Hawkins to be reinstated. Franklin Graham, the son of Billy Graham, who graduated from Wheaton in 1943, expressed dismay over Hawkins’ actions and statements in a social media post on Wednesday. 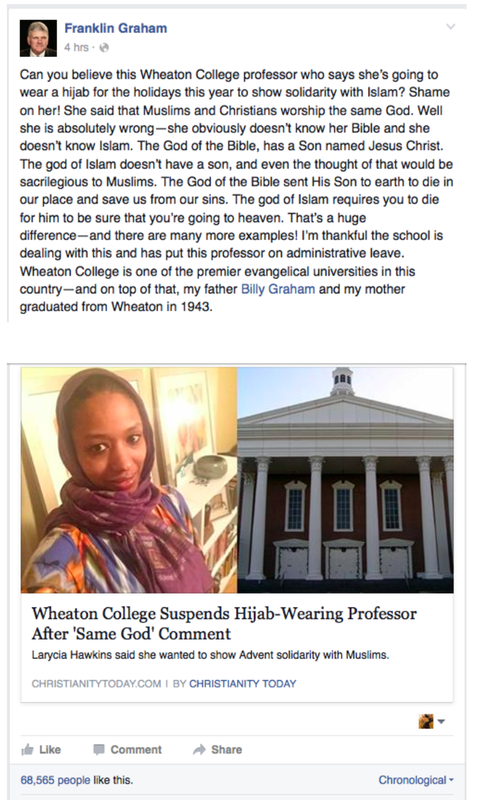 “Can you believe this Wheaton College professor who says she’s going to wear a hijab for the holidays this year to show solidarity with Islam? Shame on her!” he wrote. Graham’s remarks come in contrast to those made by his father in 1997 while being interviewed on Robert Schuller’s “Hour of Power.” During the segment, Graham stated that Muslims and those of other religions may be saved without hearing of Christ or reading the Scriptures in realizing that they “need something,” although not pinpointing what it is. Efforts to obtain comment from the Billy Graham Evangelistic Association as to whether Graham still holds to the belief have been unsuccessful, and Franklin Graham has likewise not addressed concerns over the matter. However, in the past, representatives have reportedly pointed to an article published in Decision Magazine in the 1960s, which outlined Graham’s viewpoint on the issue. Franklin Graham raised concern in 2012 for removing language from the association’s website referring to Mormonism as a cult.